If you have the urge to create profiles on social networks because either someone invited you or because you have friends on some networks but not on others, you need to slow down and think like a Nerd, not a Skittle. These waxy globules may be strange-looking to Baby Boomers and Millennials, but Nerds candy were the rage for my Generation X in the early 1980s. Sold in small paper boxes, Nerds typically arrived in two flavors per box; each flavor was “split” from the other, and separate holes at the top of each side allowed the pouring of each flavor. With thousands of social networks on the web (and dozens popping up every day), you don’t need to join every single one. Just because your friends or competition are joining such and such network, doesn’t mean the network is also right for you. As Andy Beal warned earlier this year, if you join too many social networks, prepare for sickness. I suggest you slow down and think like a Nerd. Focus your time on selected networks, not all of them. For instance, I am very active on Twitter, Facebook, and LinkedIn. I also use Flickr, Yelp, and a few more. While I have profiles on dozens of networks, I’m not as active. If I meshed with everyone on every social network at the same time, I’d be a Skittle. I prefer separating my experiences as a Nerd. And before I forget, Happy Birthday to WineLibrary TV star Gary Vaynerchuck (that’s VAY-NER-CHUK to anyone seeing his name for the first time) who turns 33 today. I guarantee you’ll enjoy this video and will learn and laugh. Tell me if you don’t. Now I want nerds and I don’t think they sell them in our vending machines. Good blog post, thanks for the craving. I agree with your post. 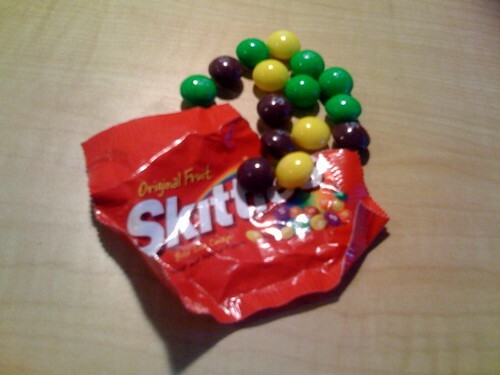 I do think that there IS one way that it is better to be more like a Skittle than a Nerd. Each Nerd candy looks completely different; while Skittles candies are all pretty much the same shape. 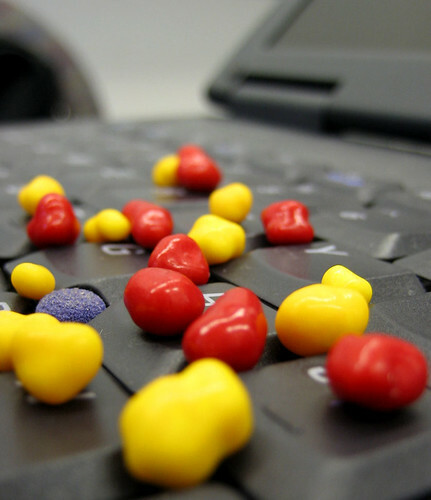 If you are trying to increase your visibility on various networks, especially for small business, using the similarity aspect of Skittles can be helpful. You want to be yourself (who you are and what you do) from site to site, so consider being like a particular color of Skittle, perhaps a yellow one, on each site: have the same, or very similar display name/handle on each site; like the yellow outside candy shell. We know what to expect. Also, think about using a similar profile/bio on each site; like the expected lemony flavor inside the yellow Skittle. What if you bit into a yellow Skittle and it was cherry inside – no big deal, but it’s not what you expected. In the social networking arena, if someone finds a cool post on your blog, and then looks to see if they like what you have to say on Twitter, then check your stuff on Flickr – or sees a comment you made on someone else’s blog, they will think – “cool! I like this person’s stuff, I’ll check them out.” That consistency, or flavor profile as the Food Network might call it, helps to keep them coming back for more; makes them more likely to hit that RSS feed button; it won’t hurt your “Google juice” either. This may be more important for those working in the social networking space than for someone setting up an account to connect with their friends. And I will admit to crunching the candy analogy a bit to far, as the individuality of each Nerd candy piece also holds it’s appeal; if we said the same thing on each site everyday, no one would want seconds. Like you, Ari, I’m active on a few networks (Twitter, FB, LI, and ones internal to my company) and passive on others. So when people ask to connect to me on Plaxo, I will — because apparently they derive value from that connection, and because I know it will help up get in touch when we want to. But the key to beneficial use of social networks is to *engage* with them — and as you rightly suggest, you’ll make yourself sick / frazzled / crazy if you try to maintain a good level of engagement across all of them. Great post. I’m going out right now to buy some nerds. I’ve picked out a couple of sites such as stumble upon that I enjoy using. I don’t have the time or the energy to be active in more than three or so. Indeed, Tim, being frazzled from too much social network activity is a bad thing. And can cause Andrea and Jen to get a sweet tooth!